A lot has been written (e.g. see this) about the RAE, so this is not the focus of this post. Instead, this post is about journal rankings. 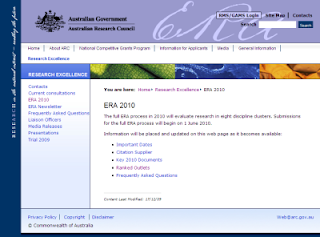 The link here is that the eqivalent exercise in Australia (Excellence in Research for Australia, or ERA) has produced a ranked list of journals to be used in assessing academic outputs. Clearly, this is contentious and controversial and it has heated up exchanges in e-mail lists worldwide. It has also been written about in the mainstream press. First, though, where can we find these rankings? Click here to find them, and click on the next link to download the Excel spreadsheet with all the data. In many nations, academics are assessed on the basis of their research outputs. Here in the UK, this was previously done using the Research Assessment Exercise and will next be done via the Research Excellence Framework, in 2012. A* - Typically an A* journal would be one of the best in its field or subfield in which to publish and would typically cover the entire field/subfield. Virtually all papers they publish will be of a very high quality. These are journals where most of the work is important (it will really shape the field) and where researchers boast about getting accepted. Acceptance rates would typically be low and the editorial board would be dominated by field leaders, including many from top institutions. A - The majority of papers in a Tier A journal will be of very high quality. Publishing in an A journal would enhance the author’s standing, showing they have real engagement with the global research community and that they have something to say about problems of some significance. Typical signs of an A journal are lowish acceptance rates and an editorial board which includes a reasonable fraction of well known researchers from top institutions. B - Tier B covers journals with a solid, though not outstanding, reputation. Generally, in a Tier B journal, one would expect only a few papers of very high quality. They are often important outlets for the work of PhD students and early career researchers. Typical examples would be regional journals with high acceptance rates, and editorial boards that have few leading researchers from top international institutions. C - Tier C includes quality, peer reviewed, journals that do not meet the criteria of the higher tiers. In the field that I mainly work in, and journal types I would submit journal articles to (urban and regional planning, human geography), how does this translate?